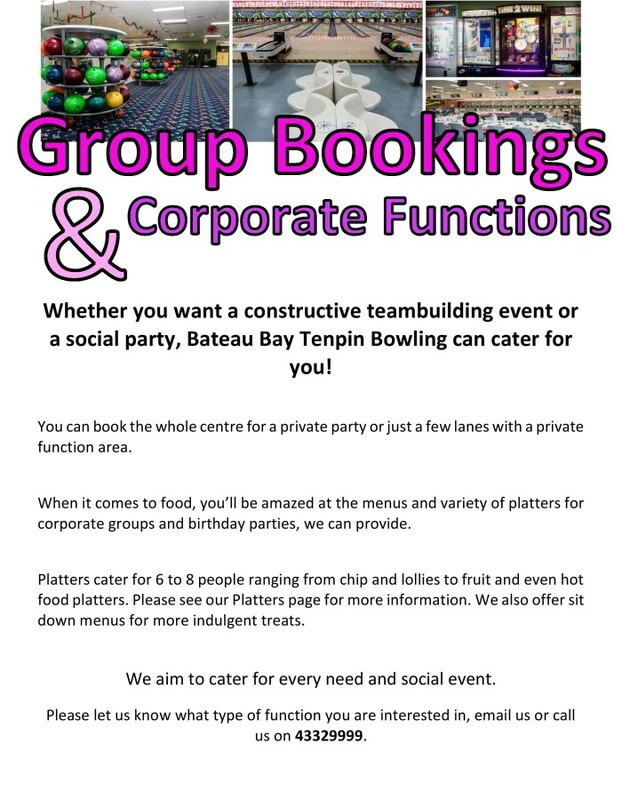 Whether you want a constructive team building event or a social party, Bateau Bay Tenpin Bowling can cater for you! You can book the whole centre for a private party or just a few lanes with a private function area. When it comes to food, you’ll be amazed at the menus and variety of platters for corporate groups and birthday parties, we can provide. Platters cater for 6 to 8 people ranging from chip and lollies to fruit and even hot food platters. Please see our Platters page for more information. We also offer sit down menus for more indulgent treats. We aim to cater for every need and social event. Please let us know what type of function you are interested in, email us or call us on 4332 9999.